24-hour forecast: Mostly sunny today and partly cloudy skies tonight. Showers, if any, will be isolated. Today: Winds: East 5-15 kt. Seas: Choppy. ; waves: 2-4 ft.; only isolated showers. Tomorrow: Winds: E/SE 5-15 kt. ; seas: Choppy. ; waves: 2-4 ft.; isolated. Marine Outlook: Wednesday night:- winds: E/SE 5-15 kt. ; seas: Choppy; waves: 2-4 ft.; isolated showers. General Outlook: (Wednesday): Continuing mainly warm weather with only isolated showers. On Ambergris Caye this morning the wind has settled down to 6 mph and the sea is calming. Our expected high is 86 and the day is lookin good. 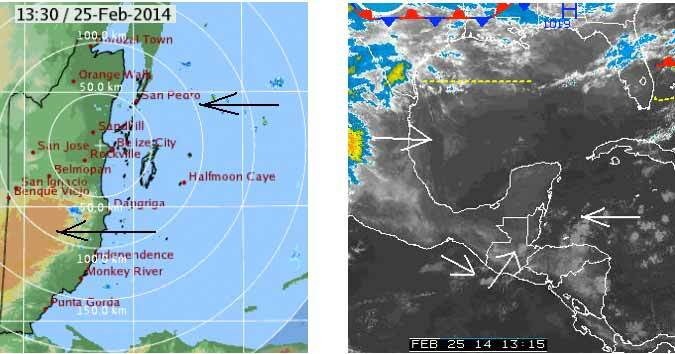 Clear early morning sky over Belmopan, but some cloud moving across occasionally. . ..Notice isolated showers iin many parts of Belize this morning, manly over the sea. . .They are dying away. ... .So probably a sunny day, with some cloud building up later.